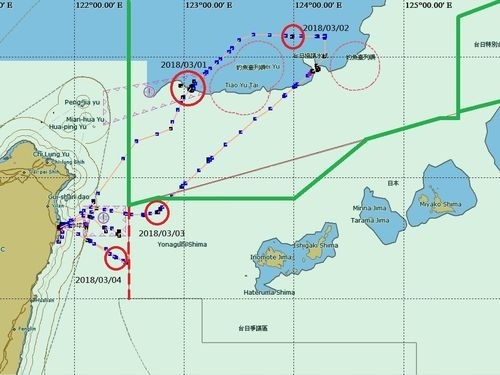 Taipei, March 6 (CNA) A Taiwanese fishing boat that was chased off by Japanese patrol vessels from waters near the disputed Diaoyutai Islands over the weekend could have its license suspended, the head of Taiwan’s Fisheries Agency (FA) said Tuesday. The Su’ao-registered Tung Pan Chiu No. 28 fishing vessel was found to have operated without authorization in waters within an overlapping area of Taiwan’s and Japan’s exclusive economic zones (EEZs), according to FA Director-general Huang Hung-yen (黃鴻燕). The vessel, listed as a longline fishing vessel, failed to apply for clearance to operate in the area as required by Article 3 of the agency’s regulations governing "Longline Fishing Vessels Proceeding to the EEZ for Fishing Operations," Huang said. Punishment could include the suspension of the boat’s operating license and its crew’s fishery permits for a maximum of one year, or possibly a fine, he explained. The dispute occurred March 3 when the fishing boat was chased and subjected to water-cannon fire by Japanese patrol boats in waters within an overlapping area of Taiwan’s and Japan’s EEZs, according to the agency. The following day the boat, which this time was chartered as a recreational angling vessel, crossed Taiwan’s temporary enforcement line but remained within the overlapping EEZ with Japan. As such, the director-general said the Tung Pan Chiu No. 28 also infringed upon Article 21 of the regulations governing recreational fishing, which states that fishing activities are restricted to areas within 30 nautical miles of the coast of Taiwan proper and offshore Penghu County. The vessel was found to have ventured beyond the boundary at 37 nautical miles, Huang said, adding that the agency is still mulling the punishment it will mete out to the Tung Pan Chiu No. 28. Despite this, however, Huang said the agency considers Japan’s enforcement of the law to be excessive, and that Taiwan’s Ministry of Foreign Affairs (MOFA) has lodged a stern protest to the Japanese authorities.